Simple steps YOU can follow on just how easy hot tub refurbishment can be! 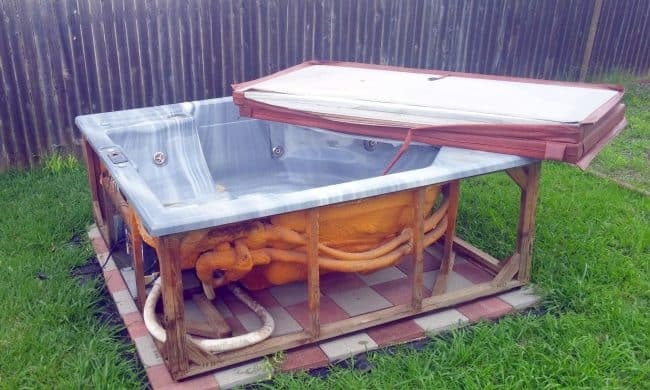 Have you ever wanted a hot tub but didn’t have $5,000 just laying around? That was the boat my wife and I were in. We knew our family would use it and would love it. 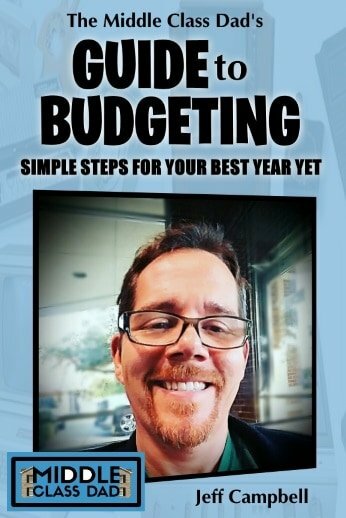 But with a new baby on the way and having just replaced one of our cars, a brand new one and the expense that comes with that just wasn’t in the cards for us. I walk you through, step-by-step, all the hurdles I had to jump through in doing just that. Just look for my TIPS where I point out specific things I wish I had done. All in all, instead of spending $5,000 or more, we got our hot tub up and running for well under $2,000. And if you don’t have the same electrical panel issue we had, your cost will be much less. 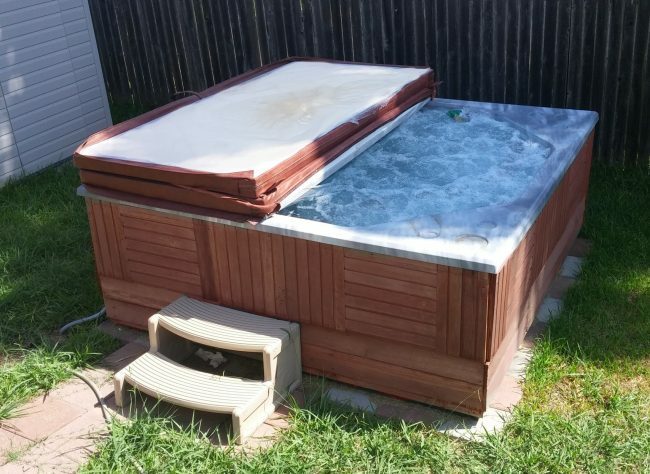 You could easily buy and fix a hot tub for under $1,000. Want to know the process I went through on hot tub refurbishment? Read on! So we began looking at places like Craigslist to see what was out there. One thing we did consider before diving into a full on hot tub refurbishment was an inflatable hot tub. They are inexpensive and easy to set up or take down. More importantly, they are easy to move if you move. If that sounds appealing, check out the Best Inflatable Hot Tub reviews. But ultimately, they just sounded, well . . . cheap. I probably would have gone that route but my wife was determined we’d get a “good” one or wouldn’t get one at all. Then one day we saw one listed on our local neighborhood HOA Buy-Sell-Trade Facebook page. It was listed at $500 and judging from the pictures it was pretty large; could be just what we needed. Given where we saw the ad we assumed it was right around the corner, but in fact, it was a good 30 miles away (not sure how he got added to the page since he wasn’t a resident of our neighborhood). In the end,my wife talked the guy down to $150. We came to find out a client of his had simply asked him to get rid of it as they now had a built-in, so I’m sure they simply told him he could keep whatever he got. Then we had to get about the business of finding someone to move the tub. After all, these things can weigh anywhere from 500 to 1000 lbs (empty) so it’s not an easy DIY. 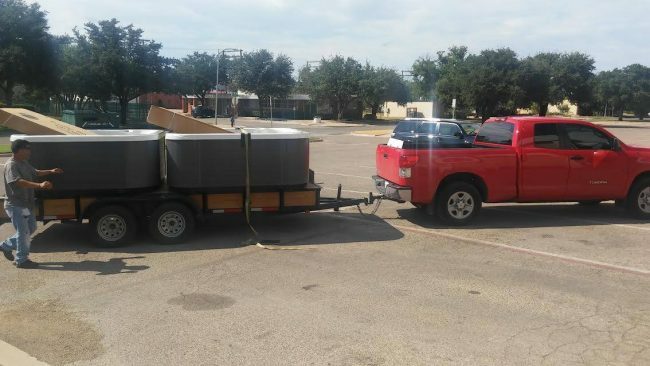 We Googled “hot tub movers”. We considered renting a truck and hoodwinking some friends. But in the end we found a local guy and his business Unique Moving & Hauling. 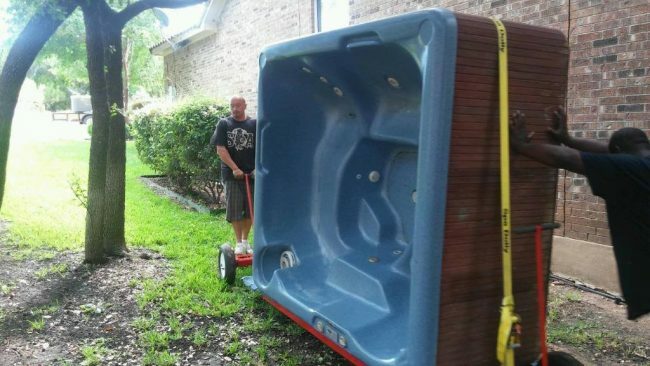 Judging from all the pictures on his Facebook page of hot tubs getting moved, we knew this guy was up for the job. He asked for $350 to move it and $150 to “hook it up”. Now when my wife spoke to him she thought “hook it up” meant literally to run a line from the breaker panel and hook it up. 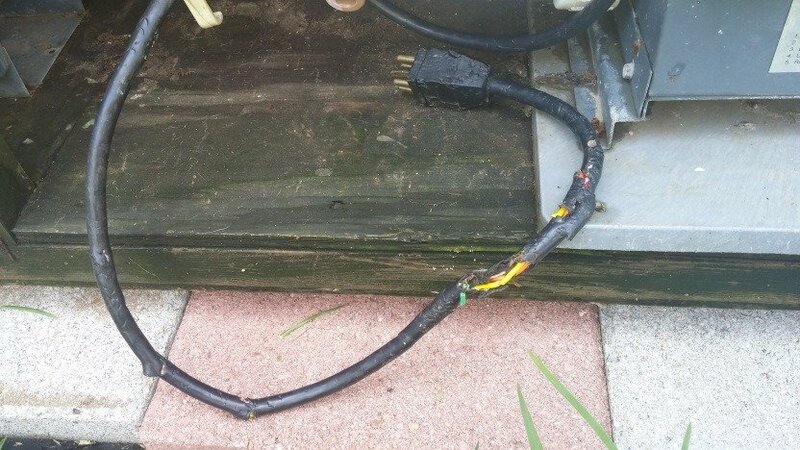 In reality, he meant to connect the existing power line to the control box in the hot tub. As simple as that part really is, $150 is a bit steep in my opinion as it would probably take him 5 minutes. So I drove out to where the hot tub was and met the seller and the movers on-site. I was amazed to see the movers consisted of just a flatbed trailer behind a truck and 2 guys. But when those 2 guys know what they are doing, it makes all the difference. The tub itself was very large; easily big enough to hold 6 or 7 people. It was clearly a little older than the seller had described (I’d guess a decade or more) and a lot of the wires had been chewed on by animals. The seller had also taken much of the wood paneling off, claiming to help make it easier to move. In retrospect, I wonder if it wasn’t because some of the wood was either missing or rotted (hard to tell until I began to put it back on). Check with your movers, but I don’t think removing the wood is necessary at all, and figuring out how to put it back on (the pieces were like a jigsaw puzzle) was more time consuming than it should have been. 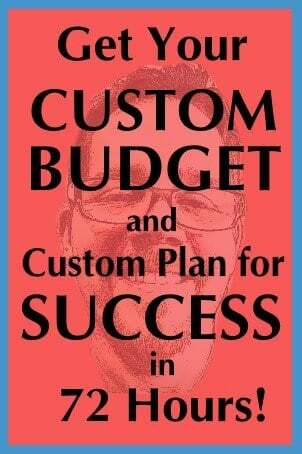 At any rate, knowing I would minimally have to give the movers something for their time, I continued with the transaction and figured I could work everything else out later. The movers stood the hot tub up on its side and used a thin but sturdy sheet of plastic to slide the tub across the grass to the flatbed. I loaded up all the individual pieces of the wood siding. We were done inside of 30 minutes. I planned on having the hot tub on paver stones I had laid out in an 8′ square in a fairly level section of my yard. In retrospect, I wish I had taken the time to make sure they were completely level as they were off a little bit. The hot tub came off the loader’s truck just as easily as it went on, and turned up on end, it easily slid through our fence gate and into our backyard. They moved it right where I wanted it and then centered it onto my pavers. Once it was sitting there, with my trusty level, I realized it was about 2″ higher towards the front than the back. Luckily side to side was about even. I knew I wanted to level it before I put water in, so I rented a refrigerator dolly/hand truck from my nearby Home Depot. The refrigerator dolly’s front lip is nice and small; perfect for sliding under the side of the hot tub I wanted to raise and easily allowing me to lift it. There would be no way to lift the tub by hand without multiple helpers. Thus while I lifted it up a few inches, my daughter Astrid placed support wedges under the hot tub frame. One thing I did before filling was ensure we had supported the weight everywhere under the tub; not just across the back where it was lowest. After all the entire hot tub’s frame is made of 2×4 wood. The last thing you want is, once full, for an unsupported mid-section to crack under the thousands of pounds of weight. So I placed braces under the diagonal cross supports, and thinner braces on the sides going towards the front. TIP: In retrospect there is no substitute for making sure your pad is level first.